(Trent Nelson | The Salt Lake Tribune) Oklahoma City Thunder forward Paul George (13) defending Utah Jazz forward Joe Ingles (2) as the Utah Jazz host the Oklahoma City Thunder, NBA basketball in Salt Lake City, Saturday December 23, 2017. Oklahoma City • By now, we all know about Paul George’s Game 1 exploits, the 36 points, the eight 3-pointers, the incessant trash-talking. But, as the Jazz and Thunder prepare for Wednesday Game 2, the Jazz chose to focus on limiting George’s impact on the defensive end. And, specifically, his impact on Joe Ingles. George took largely took Ingles out of Sunday’s Game 1, from which the Thunder emerged with a 116-108 win at Chesapeake Energy Arena. With George sticking to Ingles, it limited his ability to play pick-and-roll with Jazz center Rudy Gobert. Ingles, one of the best 3-point shooters in the league, couldn’t find clean looks at the basket. And he wasn’t able to run Utah’s offense from his customary point forward spot. 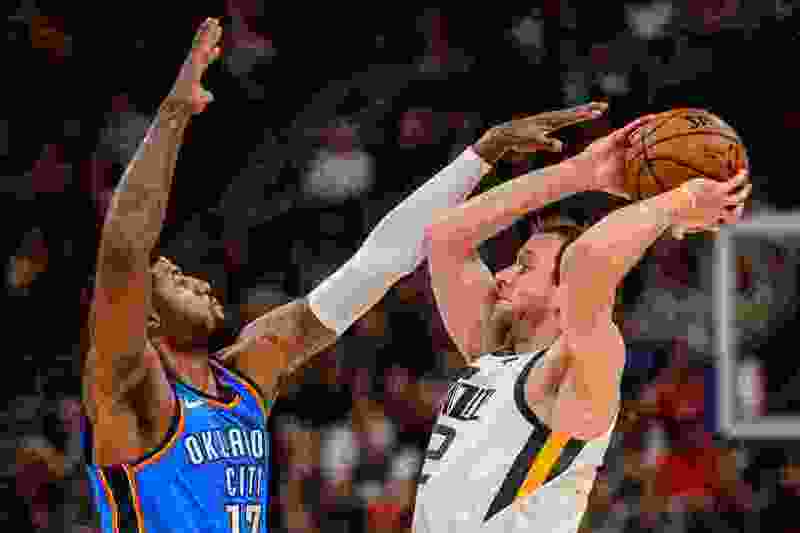 In multiple ways, OKC coach Billy Donovan’t decision to put George on Ingles instead of Jazz rookie Donovan Mitchell proved to be one of the smartest moves in Game 1, and one that went a long way towards catapulting the Thunder to an early Western Conference first-round series advantage. Mitchell has progressed to the point where he’s not going to be completely shut down by any one defender. So, Oklahoma City put Corey Brewer on Mitchell, essentially conceding Mitchell’s offense. And the rookie delivered with a 27-point, 10-rebound Game 1. But, in putting George on Ingles, the Thunder were able to shut down Mitchell’s teammates. At his best, Ingles and Gobert work pick and roll, Ingles gets into the lane and finds open shooters, and he accumulates a lot of assists. With George glued to Ingles and Westbrook hanging off Ricky Rubio, the Jazz struggled mightily around Mitchell. Ingles went 1-of-5 from the field with George as his primary defender. He went 4-of-4 from the field and 3-3 from 3-point range against other defenders. Ingles had one assist, when he averages almost five assists per game this season, including 7.3 assists in the month of April. Rubio shot 5-of-18 from the field. Jazz starters other than Mitchell shot just 19-of-42 from the field. “I know that I have to get more involved, and I will get more involved,” Ingles said. “There are different things that I know I can do. But, it will [take getting] more involved in the flow of the game. I’m not going to run to halfcourt and demand the ball. George says there are no secrets about what he is trying to do to Ingles. The Jazz know freeing Ingles and giving him space to work is essential to their offensive success going forward. He has become Gobert’s best pick and roll partner because of his patience and poise and because he’s a threat to finish in the lane. So, if Ingles can’t become a factor against George the Jazz fear they will become over-reliant on Mitchell to create and shoulder too much of the offensive load. Mitchell is a sensational rookie, but he’s still a rookie.